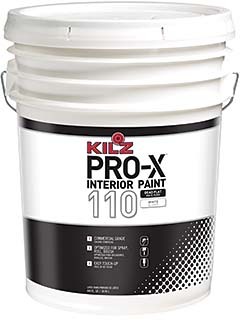 KILZ Pro-X 100 Series high-hide commercial grade latex paint has been reformulated for improved sprayability. Can also be applied with a brush or roller. Available in flat, eggshell, and semigloss sheens. Dries to touch in one hour, recoat in two hours.